The Complete National Geographic | Ooh, my favorite! 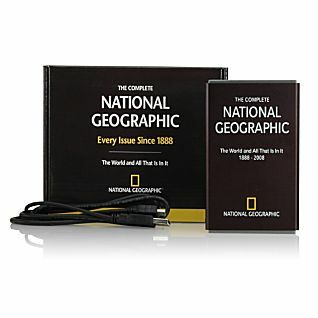 This is so cool: The Complete National Geographic on a 160-GB Hard Drive! It includes every issue from the past 12o years (1888-2008), and has been digitally remastered in hi-res, and includes an advanced interface that allows you to browse and search any topic, photo, or map. There’s also extra space for future updates, and an extra 100-GB for personal use. Wow. This is very cool. Thank you so much for sharing this. I know, I was trying to figure out an occasion for me to buy it for someone, but can’t think of anything at the moment. I hope something comes up soon though, this would be such a cool gift.